Great gifts for teachers and students, dramatists and actors. Hardcover laminated, full-color illustrated boards. New, in publisher's shrinkwrap. No dust jacket as issued. Out-of-print. Full color illustrations. 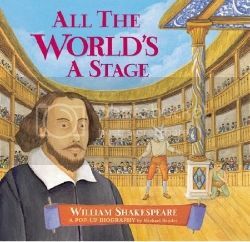 Shakespeare's world comes alive in the elaborate pop-up illustrations and fascinating text of this historically accurate portrait of the world's most famous dramatist. New, in publisher's shrinkwrap. Boxed set with paperbacks. Out-of-print. 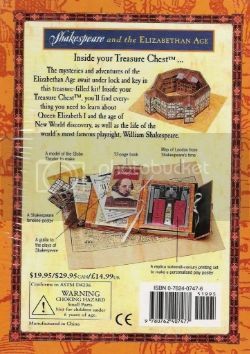 Two small paperback books, printing blocks, ink, and printing frame in a "treasure chest" box with latch. Stand-up cutouts to make a model of the Globe Theatre. 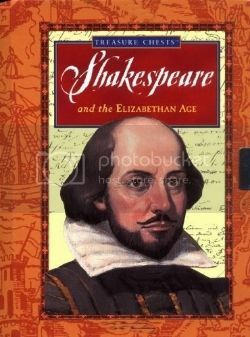 Includes timeline and map of London from Shakespeare's time.